Wood pellets are made of compressed sawdust or wood dust. 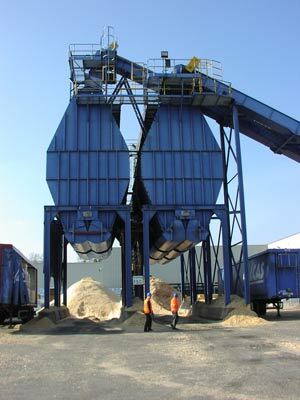 Sometimes this is a waste product from other industries (e.g sawmills). The pellets are held together by the natural lignin in the wood - no glue is needed. Lignin makes up about a quarter to a third of dry wood. It strengthens the wood as well as having water proofing properties. It is also a good fuel. Wood pellets have a very low moisture content, typically 6-10%. That means that wood pellets are a very good source of energy because very little of the energy in the pellets is used to evaporate moisture. Pellets are either made using purpose built machinery or they can also easily be made using cow feed machines as the process is very similar. Indeed a cow feed mill may make cow feed for half of the year and then produce wood pellets for the rest of the year! under extreme pressure. Photo: the Energy Crops Company Ltd. The wood is first made into a dust of a consistent size using a hammer-milling machine. The sawdust is then compressed under great pressure and forced through holes (a bit like making mince). This is a hot process and the natural lignin in the sawdust melts and binds the dust together, holding the pellet in shape and giving it that characteristic sheen on the outside. The pellets come out of the machine at around 90 degrees C, cool, and harden off. 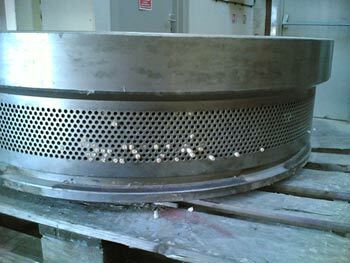 Wood pellets are cylindrical and for most domestic uses have a diameter of 6-8mm. The pellets are a dense form of fuel which means that they have a higher energy content than wood and take up less space. Photo: the Energy Crops Company Ltd.
Obviously pellets take energy to produce - the lion's share of this energy is in drying the sawdust, so it is much more efficient to work with wood that is already dry. The energy used in the production of pellets as a percentage of the total energy in the pellets can be as low as 1.62% when using dry wood, but up to 17.6% if using wet wood that needs drying. Ash content either <1% (Low), <3% (Standard) or <6% (High) to be clearly labelled.